Gear up for the Winter Olympics in the sunny Methow Valley! 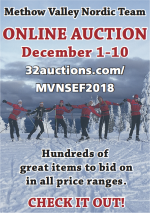 Join Nordic skiers from across the Northwest in the Methow Valley Sport Trails Association’s 30-kilometer Methow Valley Pursuit ski race on Saturday, Jan. 25. The Methow Valley Nordic Festival starts Friday, January 24 and continues through Sunday, January 26 with events and activities for every skill, age and ability. The Nordic Festival is a perfect way to celebrate the winter season and the upcoming Winter Olympics. The weekend events include the signature Methow Valley Pursuit ski race which offers a relay option for friends, families and businesses to participate in! The Pursuit ski race is also now part of the acclaimed American Marathon Ski Series. One of 15 select ski races in the nation, promising to draw new participants to the region.